Jack the Giant Slayer is not a feminist retelling of Jack and the Beanstalk or Jack the Giant Killer. Just because it has “slayer” in the title doesn’t mean this is a Whedonesque female empowerment story. Quite the opposite. This is a combination of two tales that shows us a gold harp but doesn’t use it. A lot about this movie is a tease, come to think of it. Princess Isabelle is a bit of a rebel, but it all turns on Jack. The movie is fun, it moves fast, it has pretty young people. But the protagonist is the guy. Jack rescues the princess more than once. It has a tiny egalitarian bent, but that’s as far as it goes. I believe this film has received less than stellar reviews, but the audience when I saw it had a good time — although I felt rather alone the several times I laughed out loud, but I was one of the oldest people in the house. I guess they put a few jokes in for people like me. In any case, I’m sure it’ll have a good long run on DVD. 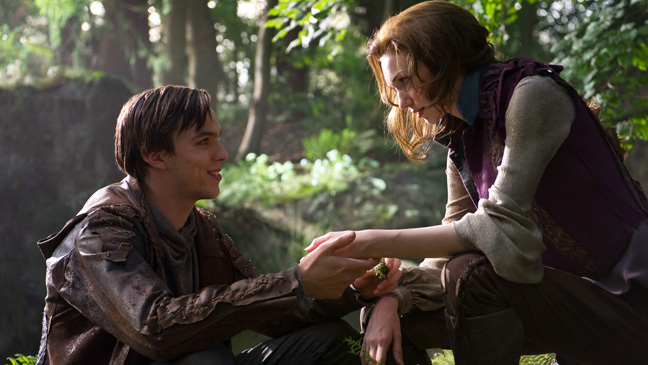 Nicholas Hoult as Jack is sweet, wholesomely cute, defers to his elders, a very old fashioned hero. The love story is rated G.
Hoult as Jack and Tomlinson as Isabelle. (c) 2013 Warner Brothers. 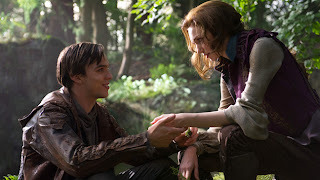 Eleanor Tomlinson as Isabelle is lovely, doesn’t quite make it to feisty. I could wish she’d had more to do because what she did was very good. 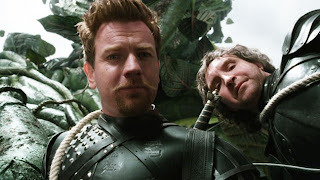 Ewan McGregor as Elmont was a fair-minded knight doing right by his betters and lessers, a charming fellow, stalwart and brave. Fun. 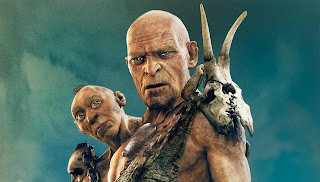 McGregor as Elmont and Marsan as Crawe. (c) 2013 Warner Brothers. Eddie Marsan as Crawe, Elmont’s second in command, is funny, sleepily sharp and a fine fellow. 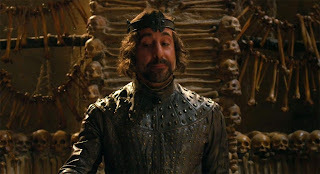 Stanley Tucci as the nasty Roderick. (c) 2013 Warner Brothers. Stanley Tucci as Roderick, the vaguely creepy nobleman Princess Isabelle is betrothed to, is delightful as ever. Ewen Bremner as Wicke is wussily wicked, a doofus with a nasty mind and manner. 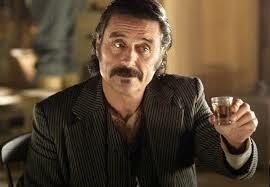 Ian McShane plays King Brahmwell — a far cry from Al Swearengen, but a charming king and dad. Christopher Fairbank as Jack’s uncle is a good solid character. OK, maybe caricature, but that’s the writing. In fact, a lot of the characters are caricatures, but I don’t think that was an accident. Ralph Brown as General Entin was really entertaining. I had hopes for more villainy, but the story kept him on a tight leash. Bill Nighy as General Fallon was fun in a predictable way for General Fallon, but less fun than I would have expected from the great Mr. Nighy. John Kassir, left, and Bill Nighy, right. Sort of. (c) 2013 Warner Brothers. John Kassir as General Fallon’s Small Head played off his elder well. A welcome oddity. Rockerick and Wicke could have gone further in their villainy as could Generals Fallon and Entin, but then it could have been a less unrealistic movie and directed toward adults instead of the 7-12 year olds it’s really meant for. Everyone behaved predictably and in scope of this sort of story. The ending is cute but not inspiring. Costume Design by Joanna Johnston was nifty. Director Bryan Singer had a good time with his animation/CGI budget, and his actors did their jobs well. 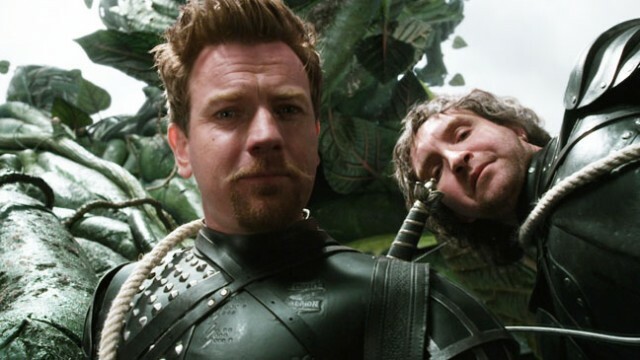 The screenplay by Darren Lemke, Christopher McQuarrie, and Dan Studney did not soar to new heights despite the beanstalk, but it was serviceable. That’s it. There’s no Prince Charming here because the hero’s a farmboy. The film is a muddy sort of charming. This is a kids’ movie — there are some cool effects, some gross-out jokes, even some visual puns. Don’t look for sophistication or originality, and you’ll have a nice afternoon. Oh, and about that damned 3D? It does not improve the film in any way and it makes my eyeballs ache. ~ Molly Matera, having seen quite enough 3D to boycott it. hey don't think Wicke is a doofus, I like him and you know what I have a huge crush on him. I think he's sooooo cute!!!!!!!!!!!!!!!!!!!!!!! Did Jackie O Color Outside the Lines?